The hot dog is a classic American food. It is tied to Coney Island. Coney Island is America's most storied amusement resort. Hot dogs have been tied to Coney Island since frankfurter first met bun. Nathan's century-old triumph of business skill is only part of the Ellis-Island-meets-Coney-Island story. The name "Coney Island hot dog" means one thing in New York. It means another in the Midwest and beyond. This is thanks to immigrants from both Northern and Eastern Europe. Historians disagree on the hot dog's origin story. But many credit Charles Feltman. He was a Coney Island pie-wagon vendor. He is credited with inventing the fast food. He served hot dachshund sausages in milk rolls. He served them as early as 1867. The National Hot Dog and Sausage Council says Feltman opened a hot dog stand. It was on Coney Island. This was in 1871. He sold 3,684 sausages that year. Sausages took Feltman far. He’d gone upscale by the turn of the century. He created Feltman's German Gardens. It was a huge complex. It had restaurants. It was on Surf Avenue. It employed 1,200 waiters. Seafood became Feltman's specialty. But he still had seven grills dedicated to hot dogs. He sold them for ten cents apiece. This was during the 1910s. Nathan Handwerker was a Polish immigrant. He had a day job. He was a restaurant delivery boy. He worked Sunday afternoons. He worked at Feltman's German Gardens. His job was slicing rolls. Jimmy Durante and Eddie Cantor encouraged Handwerker to strike out from Feltman's. They told him to sell hot dogs for a nickel instead of a dime. This is according to Handwerker's 1974 New York Times obituary. Durante and Cantor worked as singing waiters on Coney Island before they found fame. Handwerker did just that in 1916. He opened a small hot-dog stand with his wife. The stand was at Surf and Stillwell. The subway's extension to Coney Island in 1920 brought countless New Yorkers to his stand. "Society people. Politicians. Actors and sportsmen flocked to Nathan's." That is according to the obituary. "They brushed shoulders with truck drivers. Laborers. And housewives." Franklin D. Roosevelt famously served Nathan's hot dogs. It was at a 1936 lawn party. It was for Britain's King George VI and his wife, Queen Elizabeth. She was the mother of the now-reigning Queen Elizabeth II. Outside New York, the Coney Island name brings up a very different hot-dog tradition. In Michigan, "Coney Island" doesn't mean an amusement park. Instead, it is but one of an estimated 500 diners in the Metro Detroit area alone. They serve Greek food. And they serve "Coney dogs." 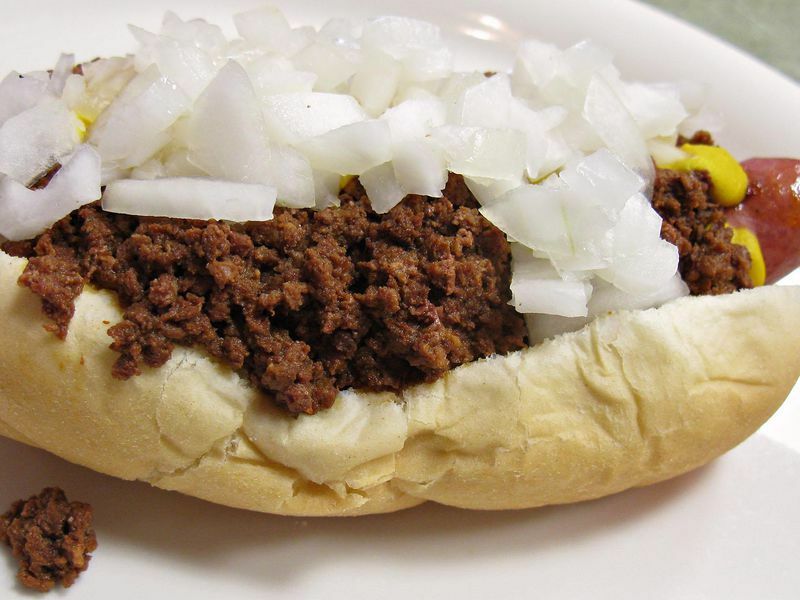 Coney dogs are hot dogs smothered in chili or ground beef. They have mustard. And they have onions. There are more diners in Michigan. They are also found across the Midwest and beyond. The Coney dog was spread across the eastern U.S. by various Greek and Macedonian immigrants. That was in the 1900s and 1910s. The restaurant owners were part of the great wave of Greek migration to the U.S. This included 343,000 people. This was between 1900 and 1919. They fled economic ruin. It was caused by Greece's 1893 bankruptcy. And it was caused by a crash in the price of currants. In that era, Americans associated New York's Coney Island with hot dog realness. Back then, the name "hot dog" was out of favor. This was amid the concern about meat-packing standards. These were inspired by an Upton Sinclair book. It is called “The Jungle.” It still carried a hint of suggestion that the cheap sausages were made of dog meat. Handwerker called them "red hots.” Others called them "Coney Island hots." Naming the inventor of the Coney dog is a fool's errand. 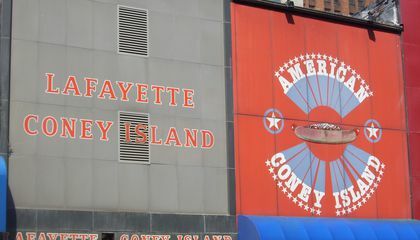 Various Coney Island restaurants in Michigan and Indiana vie for the title. They claim founding dates in the mid-1910s. But they don't appear in city directories from the era until the 1920s. Many Greeks and Macedonians likely hit upon the idea of dressing hot dogs in variations on saltsa kima. This is their homeland's spicy tomato-based meat sauce. It's easy to locate the Coney dog's ground zero. The Midwest's version of Surf and Stillwell. That would be the corner of West Lafayette Boulevard and Michigan Avenue. That is in Detroit. Today, Nathan's is an international chain. It has more than 300 restaurants and stands. They are mostly on the East Coast. It's added a chili dog to its menu. Michael Quinn is a Coney Island blogger and historian. He is bringing back the Feltman's red-hots brand. They went extinct with Feltman's restaurant. This was back in 1954. He's teamed up with a sausage-maker. He makes a red hot in tribute to the original. He's selling them at pop-up events. He has a history-minded revenge. Quinn sells hot dogs for half of Nathan's price. This article mostly talks about hot dogs, and how it is an American food. The article also talks about Coney Island and there hot dogs. It is cool how Charles Feltman sold 3,684 hot dog that year. I love Coney Island and I also like hot dogs so I really liked how they told the story behind it.